It relies on the MemoryCache::AddOrGetExisting returning null on the very first call that adds the item to the cache but returning the cached item in case it already exists in the cache. A clever trick worth of remembering. thanks to the jsonwebtoken package. 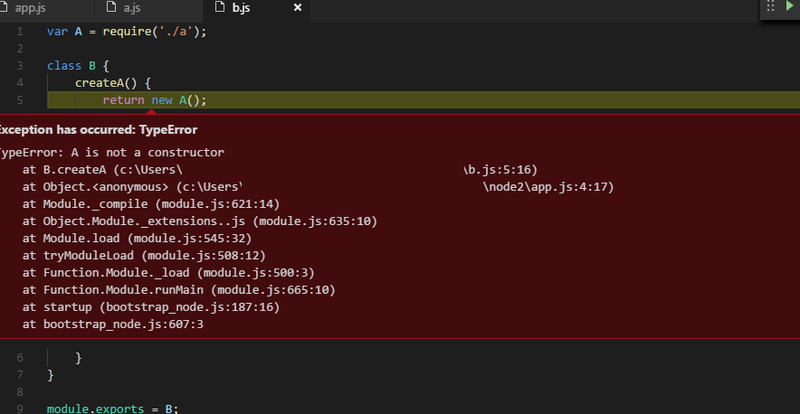 In case of .NET, things are a little bit more complicated as the JWT is implemented in System.IdentityModel.Tokens.Jwt. This is unfortunate, as the 5.x.x version of this library has been reimplemented to rely on Microsoft.IdentityModel. Because of this, many older tutorials became deprecated and people tend to have different issues. The question here is to explain the incorrect behavior of the generator. We've been using the WS-Fed for ages, I myself wrote a couple of tutorials and was often emailed by people asking for some details. As time passes, the Ws-Fed is pushed away in favor of the SAML2 protocol. And yes, SAML2 has some significant advantages over Ws-Fed, namely it supports multiple bindings. it is the RP that creates a direct HTTPs request to the IdP's profile endpoint to retrieve the user token. 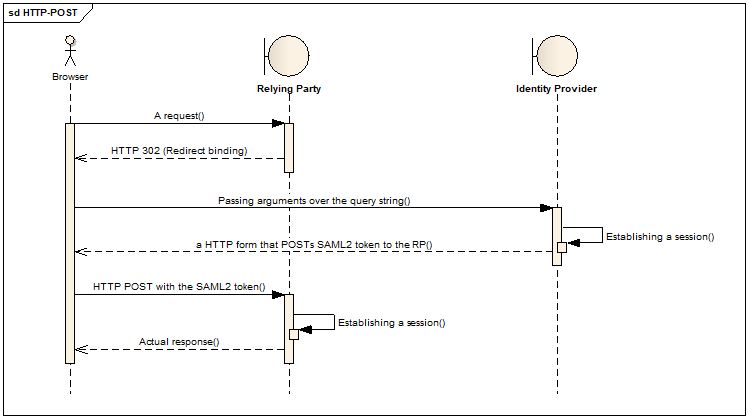 Note that any binding can be used to initiate the flow from the RP to the IdP and any other binding can be used to pass the SAML2 response token from the IdP to the RP. 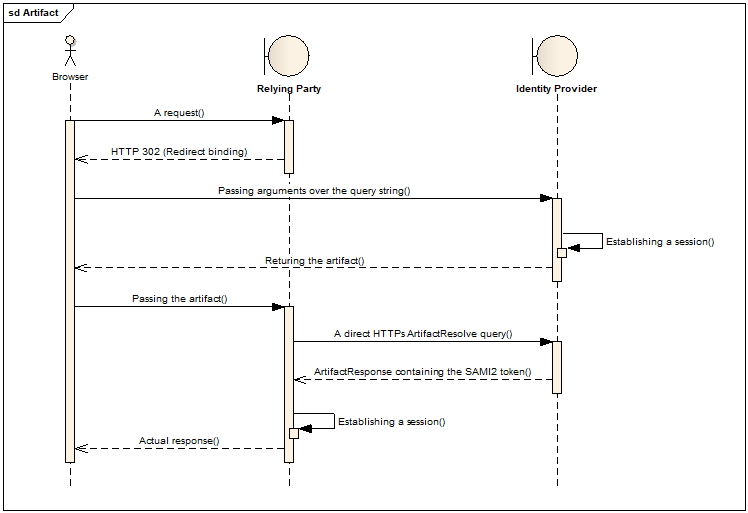 What this blog entry is about is how difficult it was to implement the SAML2's Artifact binding in a scenario where the ADFS is the actual Identity Provider. 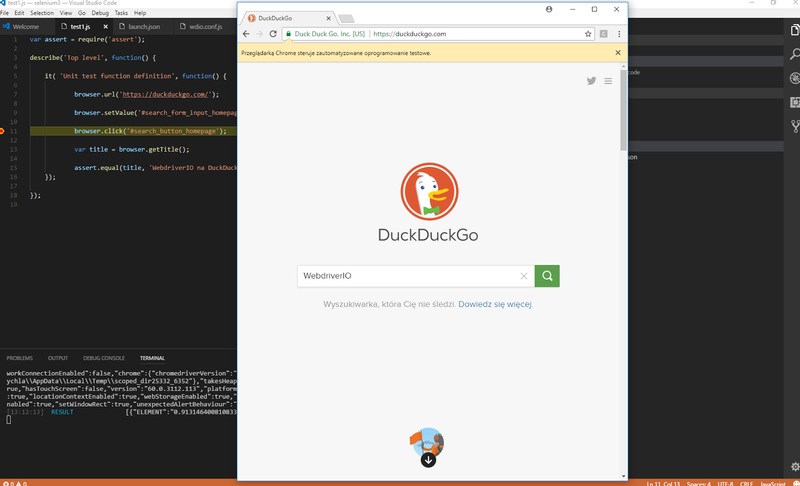 The implementation turned out to be more or less straightforward as long as HTTP-Redirect and HTTP-POST bindings are considered. It turned out, however, that the Artifact binding is a malicious strain and just doesn't want to cooperate that easily. 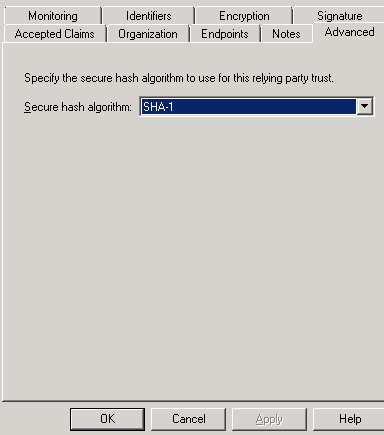 Problems started when the ADFS was expected to return the artifact that the Artifact Resolve endpoint at the ADFS's side was about to be queried so the artifact could be exchanged for a SAML2 token. 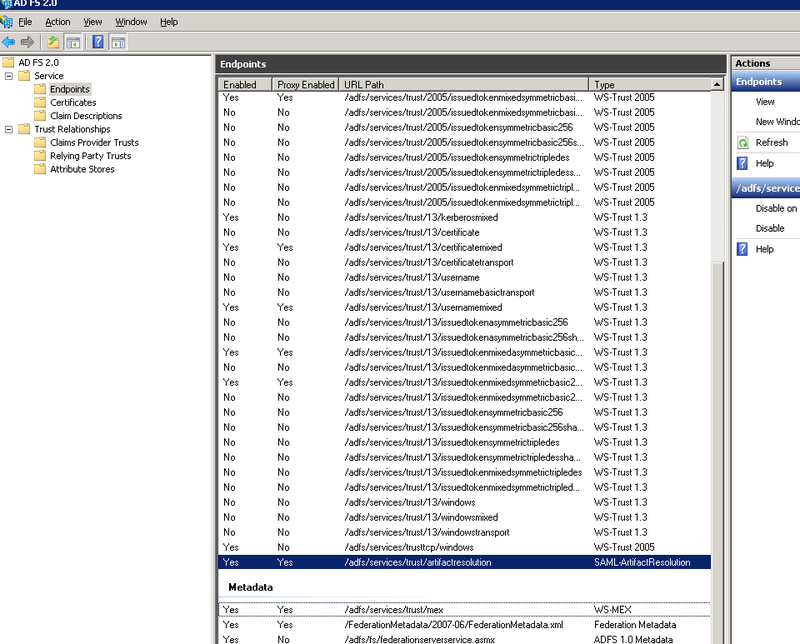 A following list enumerates some possible issues and could be used as a checklist not only by implementors but also by administrators who configure a channel between a Relying Party and the ADFS based on the Artifact binding. 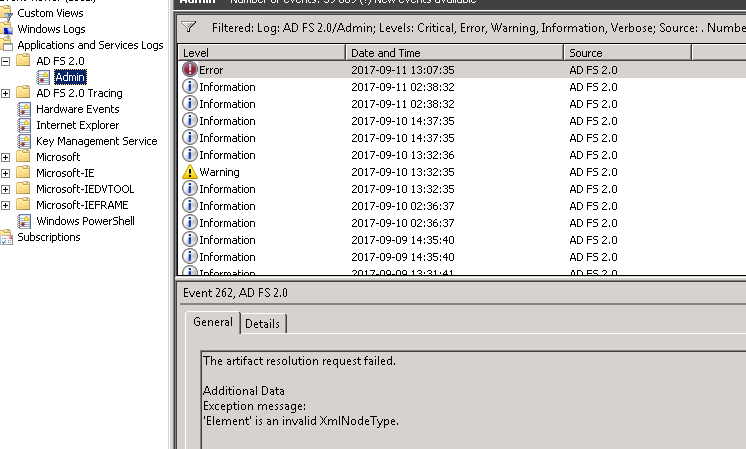 make sure you consult the Event Log entries (under Applications and Services Logs/AD FS 2.0/Admin) to find detailed information on request processing. What you will get at the RP's side from sending invalid request is just urn:oasis:names:tc:SAML:2.0:status:Requester (which means that your request is incorrect for some reason) or urn:oasis:names:tc:SAML:2.0:status:Responder (which means ADFS is misconfigured). On the other hand, peeking into the system log can sometimes reveal additional details, e.g. (this one was tricky)make sure the Signature goes between the Issuer and Artifact nodes. By taking a look into ADFS sources (the Microsoft.IdentityServer.dll) you could learn that ADFS has its own exclusive, hand-written algorithm of signature validation which doesn't use the .NET's SignedXml class at all. This manually coded algorithm expects this particular order of nodes and logs 'Element' is an invalid XmlNodeType (as shown at the screenshot above, not too helpful) if you put your signature as the very last node. Frankly, I don't see any sense in this limitation at all. <samlp:Response ID=\"_e0d8b313-ba58-4325-a9af-39a406a73bc8\" Version=\"2.0\" IssueInstant=\"2017-09-11T10:20:49.277Z\" Destination=\"https://rp.com\"
The response has to be extracted from the SOAP Envelope and verified (assertions are signed). Then, it can be passed down the pipeline as if it comes from any other binding. Node the actual title description is language specific so you could probably tweak the assertion. Mine is specific to my Polish locale. flags that set the very same debugging port VS is expecting. You can also replace FF with Chrome in the capabilities section. 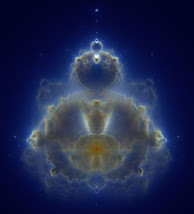 navigate to the address returned by ngrok and you will get the response from the server behind the proxy. This has been a great week as VS2017 has finally got its RTM version. Unfortunately, for some developers news aren't that great. Silverlight projects are not supported in this version of Visual Studio. To maintain Silverlight applications, continue to use Visual Studio 2015. Great. Note, though, that Silverlight 5 support lasts till 2021. This effectively means that starting from now, till 2021, people will have to stick with VS2015 for some projects, despite VS2017, VS2019, VS2021 or any other newer version is released. 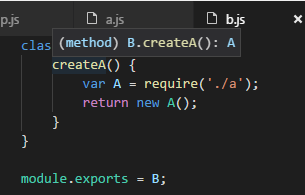 One of the top questions about promises I was asked lately is a question on how to call promises in a sequence so that the next starts only after the previous one completes. The above code yields 1,2,3,4,5 as soon as 1 second passes and there are no further delays, although people expect them here. The problem with this approach is that as soon as getPromise is called, the promise code starts. There are then 5 timers in total, started in almost the very same time, the time it takes the map function to loop over the source array. In order to call promises in a sequence we have to completely rethink the approach. Each next promise should be invoked from within the then handler of the previous promise as then is called only where a promise is fulfilled. 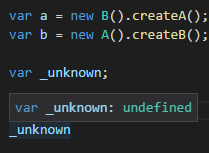 A simple structural trick is to use map.reduce in order to loop over the array so that each time we have the access to the previous “value” (the previous promise) and the current value (current number/whatever from the array). The map.reduce needs an “initial value” and it should be a promise so we just feed it with a dummy, resolved promise. A neat trick worth of remembering.